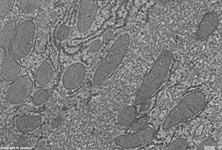 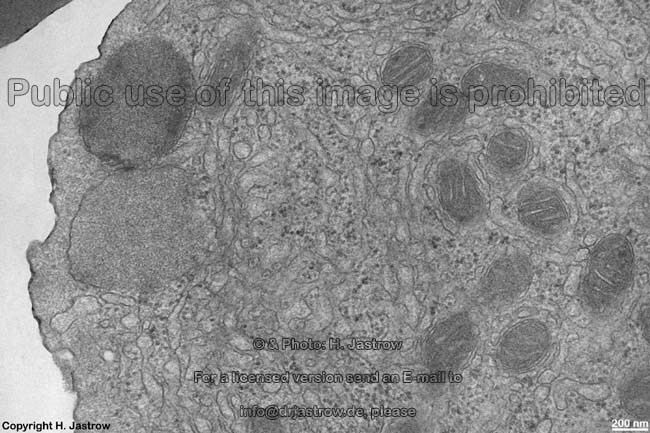 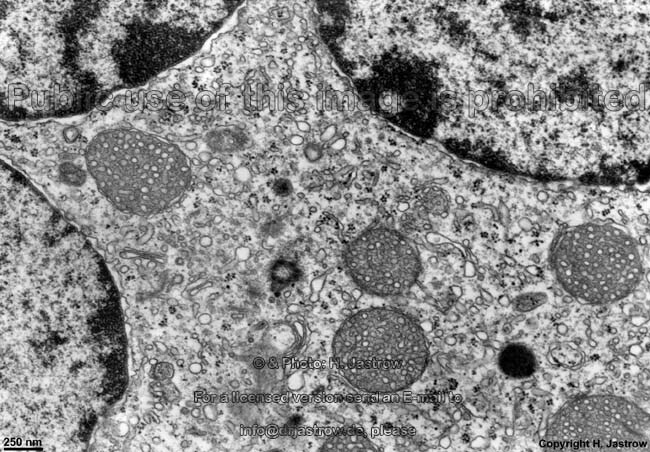 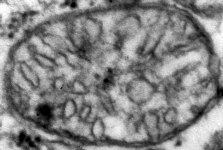 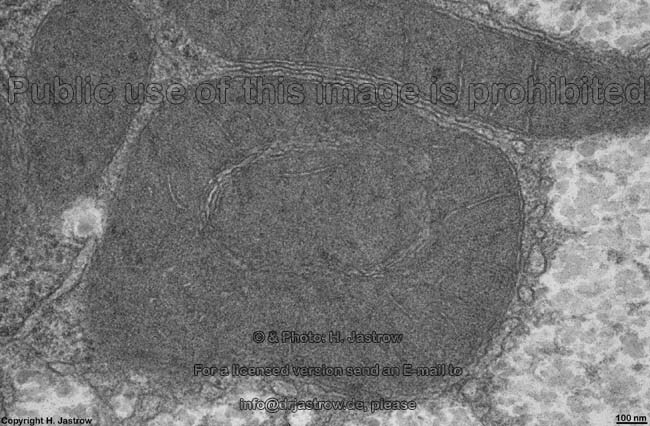 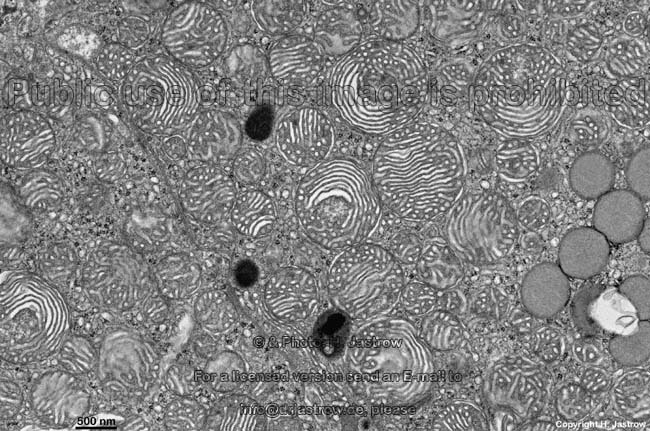 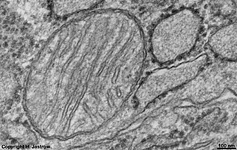 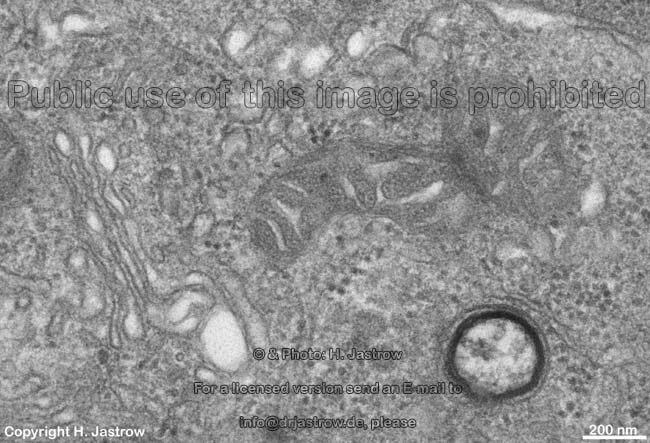 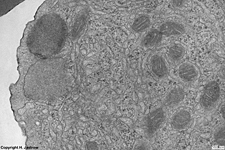 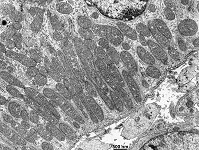 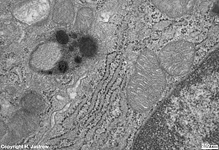 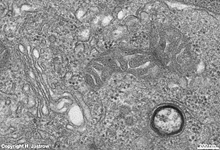 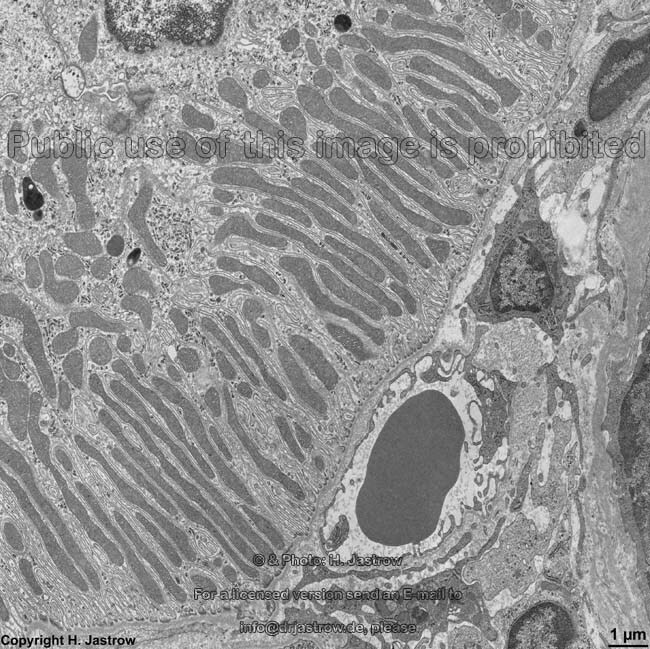 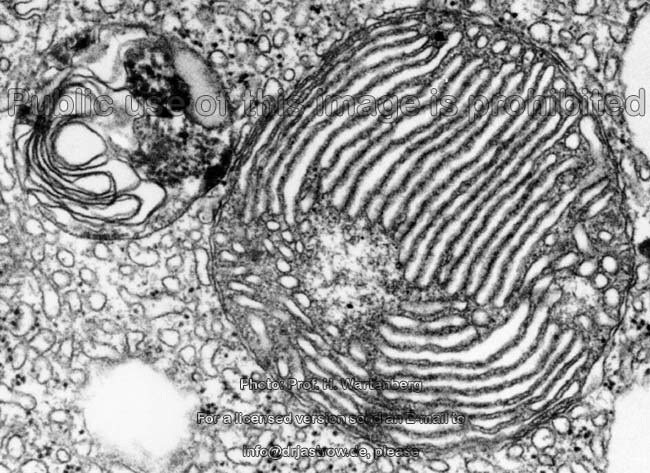 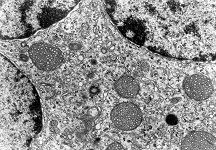 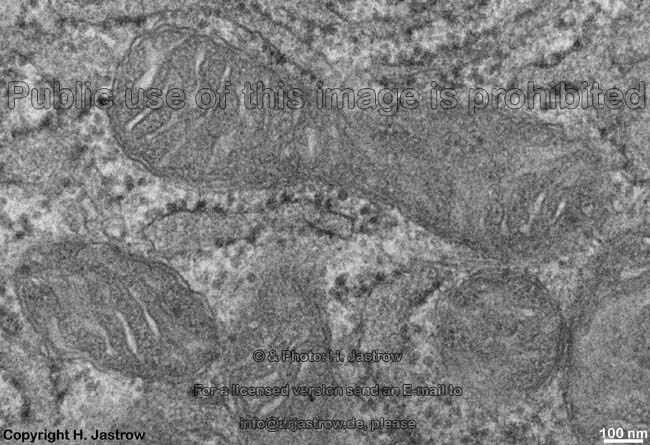 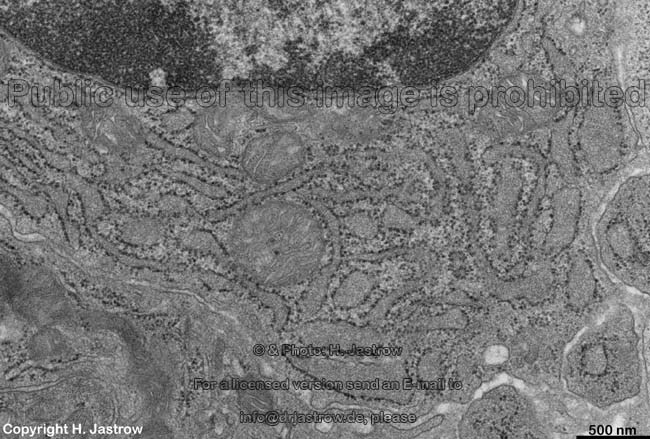 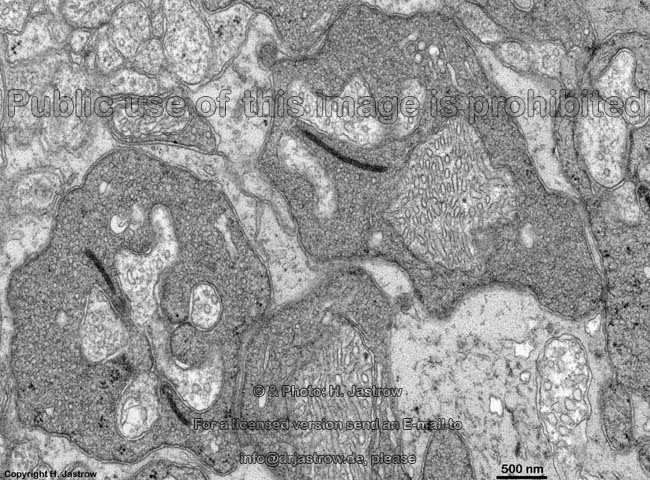 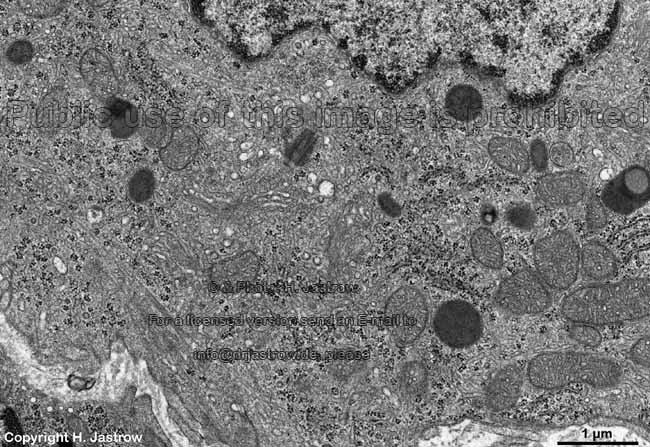 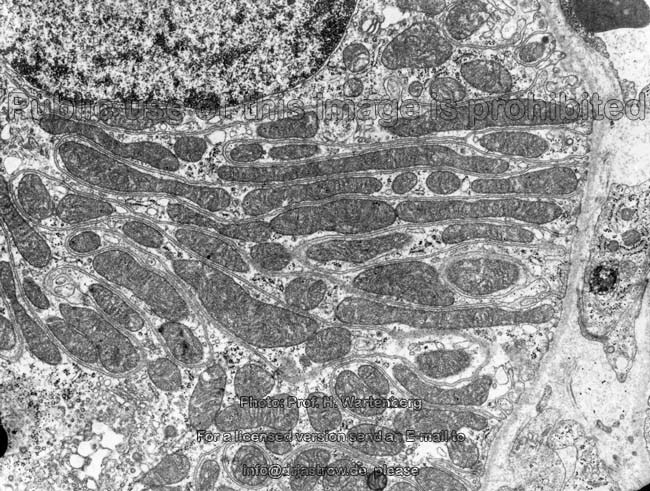 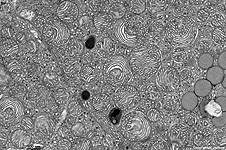 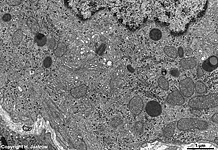 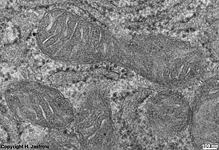 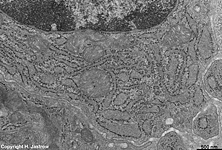 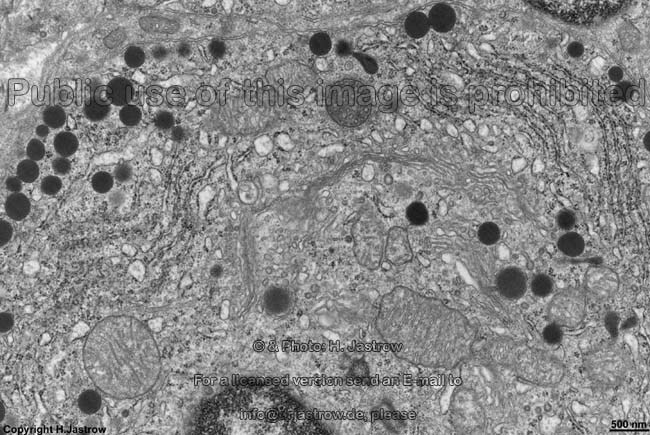 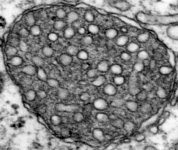 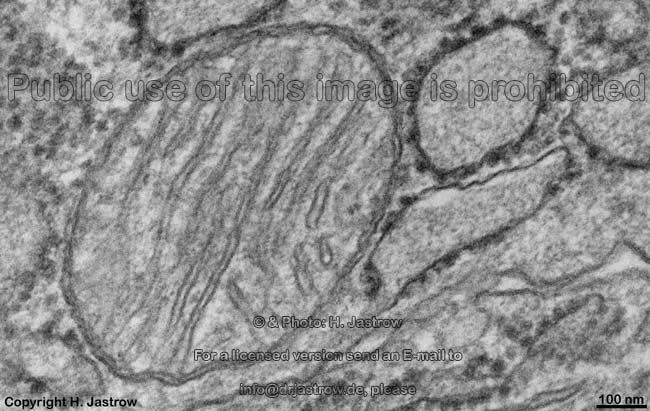 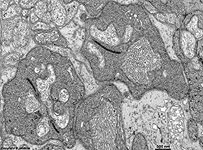 A mitochondrion (Terminologia histologica: Mitochondrion) is a cell organelle of eucaryotes with ovoid shape that is the major source for intracellular energy. 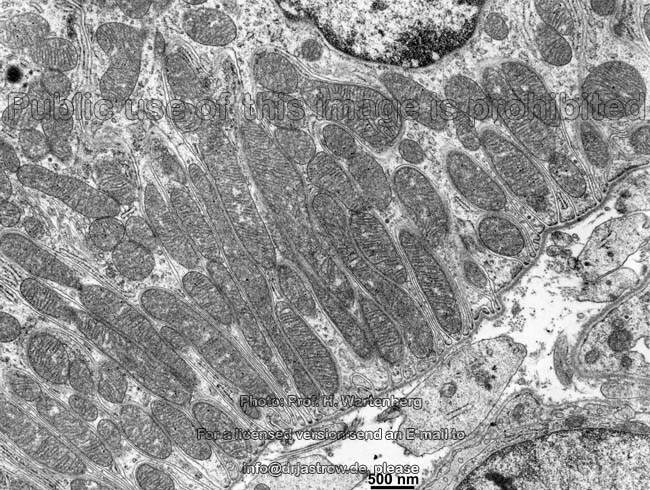 Mitochondria are present in all but mature red blood cells. 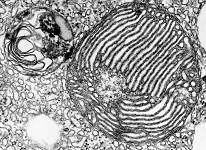 They can migrate through the cytoplasm and change their shape. 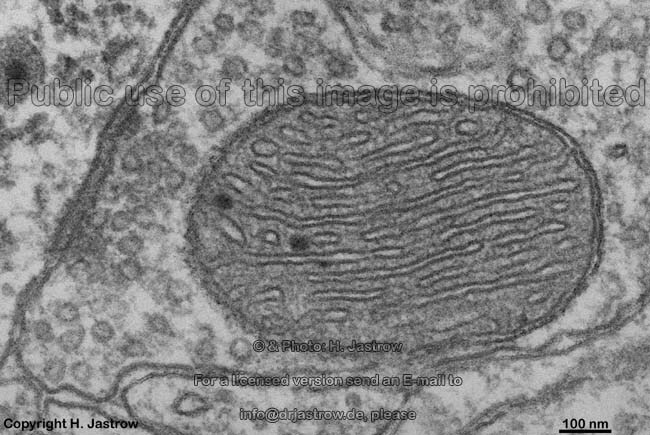 These organelles have an outer unit membrane (membrana mitochondrialis externa) and an inner membrane (membrana mitochondrialis interna). 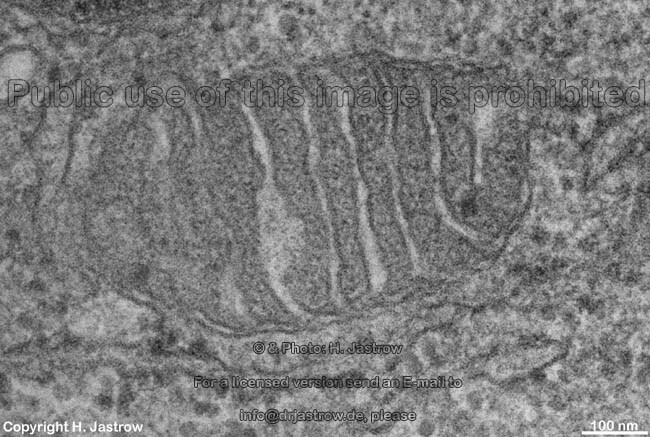 The latter has protrusions into the matrix (mitochondrial plasma). 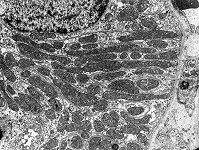 - further there are intermediate forms of crista and tubulus type. 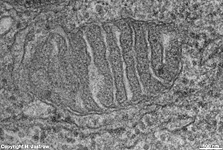 Depending on its protein content the matrix of mitochondria may be dark or bright. 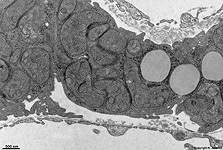 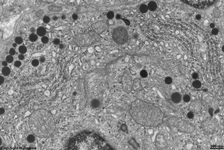 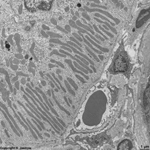 In cells of the bone and occasionally in other cells electron dense granules, 25 - 50 nm in diameter, consisting of phospholipids and rich in calcium are present. 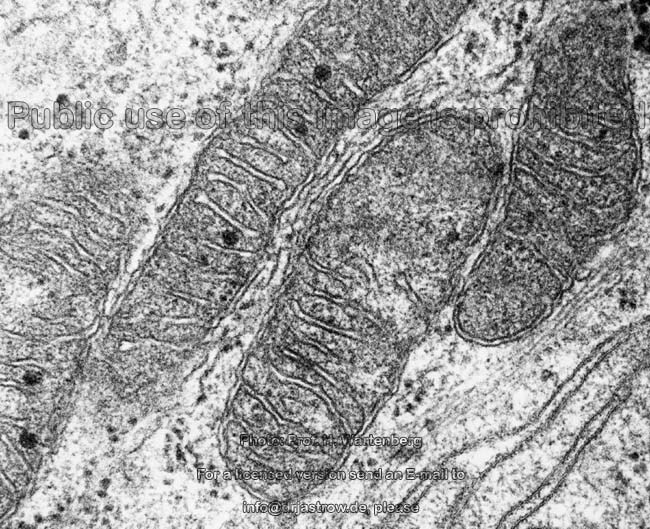 Mitochondria have their own DNA and RNA necessary for synthesis of specific mitochondrial proteins and autoreproduction. 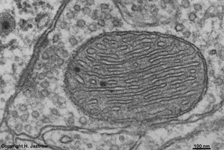 Usually mitochondria are present at intracellular locations where energy is required. 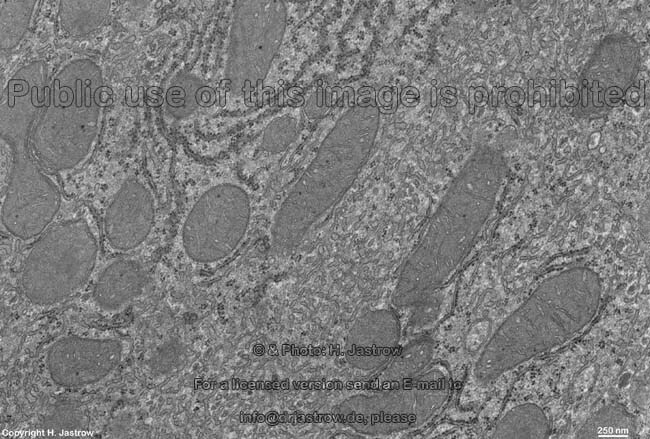 They contain specific enzymes, e.g. 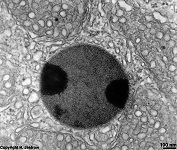 of the citrate-cycle and for oxidation of fatty acids. Energy is used for synthesis of Adenosine-triphosphate (ATP). 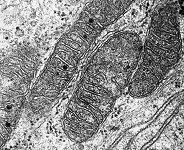 Mitochondrial half-life is thought to be about 5-12 days. 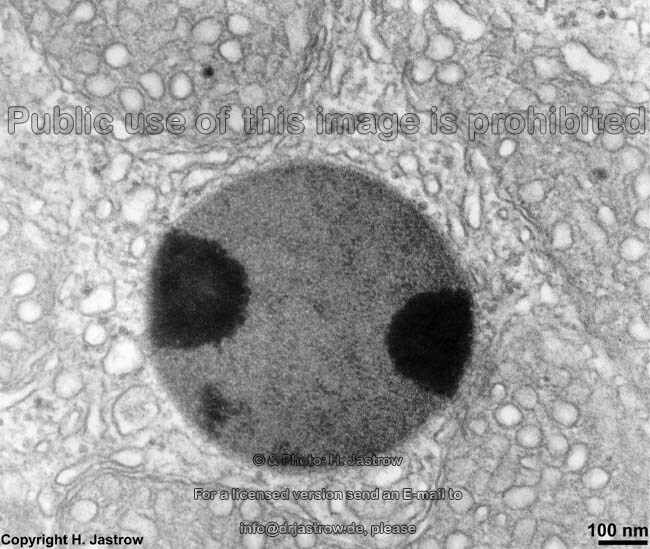 Some pictures were kindly provided by Prof. H. Wartenberg; other images, page & copyright H. Jastrow.